Chinese Internal Boxing: Techniques of Hsing-I and Pa-kua is an illustrated martial arts guide to two soft-style Chinese martial arts. Chinese internal boxing and other internal martial arts do not depend on muscular strength. Instead, their power is drawn from the cultivation and practical application of internal energy, or ch'i, making them perfect for people of all ages and all levels of fitness. With clear, easy-to-follow instructions and over 380 black-and-white photos and diagrams, this indispensable martial arts book is ideal for both wushu beginners and advanced practitioners. 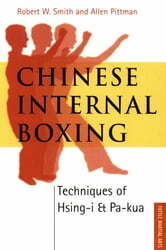 It describes in detail and fully illustrates the basic techniques of Hsing-I and Pa-kua, including the five fists and twelve animal styles of Hsing-I and Pa-kua's eight palm shapes and eight traditional methods of walking the circle.